Late last year Google fired a few shots at PayPal when they waived merchant fees at Google Checkout for the rest of the year. Today they hit hard, using their biggest gun to promote the service: the Google homepage. 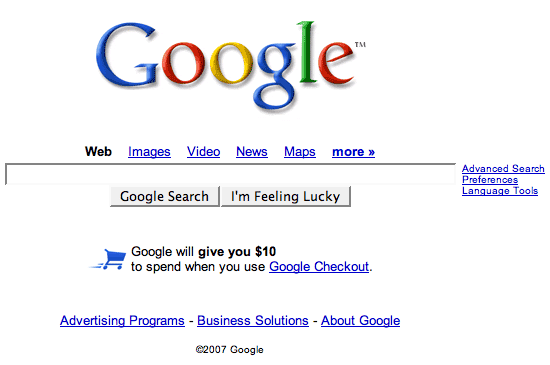 Google has added a link to Google Checkout along with a $10 coupon to use with Google Checkout merchants. Hitwise predicts we’ll see a big spike in Google Checkout traffic. I agree. Small merchants overwhelmingly use PayPal to take credit card payments (we use them on CrunchBoard). But Google’s Checkout product is superior in a lot of ways. And the fact that they are promoting it on the Google home page and in search results is a real competitive advantage. Whether it is enough to overcome PayPal’s own big gun – their lock on eBay – isn’t obvious. But everyone loves a good fight, and the word is Checkout has more interesting stuff coming.